Below is an article written by Onessa, one of our HFA teachers, about their experience with their first HFA workshop in Finland in September 2011. 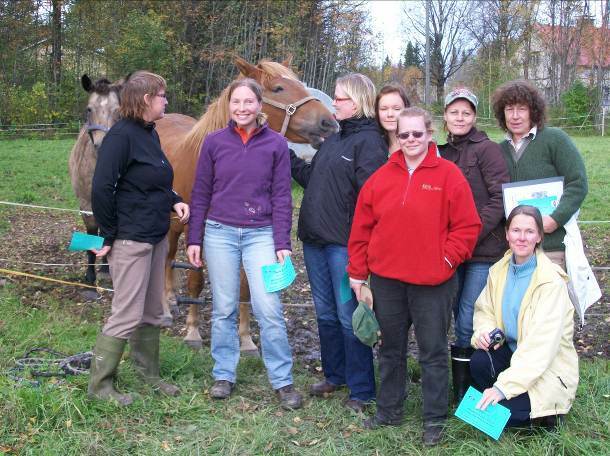 “We are so very pleased to announce the successful completion of the inaugural course for Horstmann for Animals workshop in Finland. Seija Tikka was the gracious hostess, unstinting in her hospitality for this event held on the Tikka family property in Kiuruvesi, and made it home to six other participants. They were Marina Jaconelli and Monika Russmann, both from Sweden, and Mirja and Sera Remes, Tuija Liikkanen and Sanna Sydänmaalakka from Finland. Instructors were Carrie Rainwater and Onessa from Australia. After a full demonstration of the healing technique, the learning work was focussed first of all on Seija’s four beautiful horses – Vihuri, Miina, Tahti and Mustina. We started with the horses in their individual stalls and because of the unfamiliar condition of nine people crowding around them, understandably the horses were at first a little nervous and needed to be held and sometimes a little restrained. However, as we continued and the horses recognized the energy flowing and the nature of Horstmann, they became totally relaxed and at ease, and paid no attention as to how many people were gathered around them or what we were doing. They came to totally welcome all of us and remained unmoving and receiving as we all became more competent with finding the points and directing the energy. We accomplished Arm-Shoulder Release, Ileo-Sacral Release, Foot Release and Self-Sabotage Release with ease and grace by the end of our five days together. 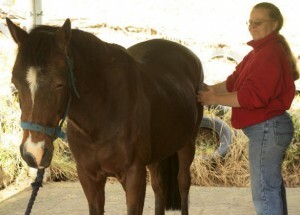 We could tell that the horses were enjoying the treatments because they no longer needed to be held, their eyes were often closed, ears relaxed, heads down, bottom lips drooping and quivering. Oftentimes they opened their mouths and yawned widely to relieve tension in the face region and upper neck at the poll. To me the greatest surprise came when we had the opportunity to work with more than a hundred of Seija’s milking cows. At first when we ventured out into the pasture where the cows were grazing, many of them got up and starting walking away from us – not a very encouraging sight! However, we stood quietly and made no move towards them. After a little while, I approached a cow and demonstrated how we could work on an animal from a little distance away, by focusing our intention through our fingers and hands without having to make actual physical connection at all. Soon after, the other girls began to do the same thing and experienced how miraculously Horstmann can work. Before long I watched as everything became quite still and relaxed again, and then I observed how a cow would make a connection to one of us and would walk up and present themselves for a treatment, whether it was on or off the body – the cows quite clearly showed what they wanted. And if it wasn’t right, they simply walked off a step or two, and the practitioner could catch up and try again. It was beautiful to watch. At the end of the afternoon, all the cows had returned and we were surrounded by a sea of cows at fairly close quarters, either standing or lying down, all chewing their cud and completely at peace. In addition to the larger animals there were four of Seija’s husbands hunting dogs to work on, and two adult cats that lived in the cow barn. The two little kittens in the horse barn were so full of life and playfulness that they were clearly not in need of any re-alignment at this early time of their boisterous young lives. By the end of our course, everybody was feeling confident of their new skills, and was enthusiastic to put the Horstmann for Animals technique into practice when they returned home. Besides working on their own horses, many others in the group had creative ideas for how to do this for other animals, and the general feeling was that we were at the very beginning of something far bigger than us and hugely important in the world. Seija Tikka is now the Teacher for Horstmann for Animals in Finland and in the future will be holding courses in Kiuruvesi so that this much needed gift for our animal companions can be passed along. We wish to thank all the participants who gathered from near and far and who made this such a memorable experience by their willingness and enthusiasm to get hands-on, and who will forever remain our loved friends. Gratitude also to Helena Räihä, for acting as our intermediary and for all the organizational and translating work she did for us – we would have been lost without her.